File for divorce. 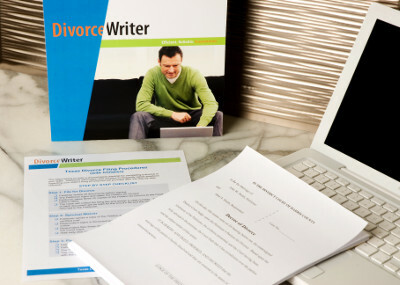 When you represent yourself, you will prepare your own divorce papers using an online do-it-yourself divorce product like DivorceWriter, which also includes state-specific step-by-step instructions. Forms and procedures vary by state (and sometimes by county), but you will always file a Petition for Dissolution or Complaint for Divorce along with a few other documents at the court clerk's office. You will also need to pay the filing fee at that time. Serve your spouse. The required method for service of process also varies by state. In many states, service can be as simple as hand-delivering or mailing a copy of the divorce papers to your spouse. In other states, you must have your spouse formally served by a Sheriff or process server. It's usually best if your spouse is willing to sign a document acknowledging receipt of the divorce papers. Finalize the divorce. Often, this involves waiting out the mandatory waiting period, if any, and attending a hearing, if required in your state. During this time, you will also need to complete any required mandatory parenting class. You will probably also need to file additional documents including a Judgment or Decree to finalize your divorce. The cost to have an attorney represent you in an uncontested divorce varies widely from state to state and even sometimes from county to county. Some attorneys charge a flat rate while others charge by the hour. On average though, you will pay between $1,500 and $5,000 to have an attorney file for divorce on your behalf, although in some areas, the cost may be significantly more, even when spouses have agreed on everything. DivorceWriter charges $137 for state-specific divorce papers and step-by-step filing procedures. You pay your own filing fee when you file for divorce. With DivorceWriter, there are no hidden fees or charges, and you can make unlimited revisions at no additional cost for two years. While most lawyers appreciate their clients' desire to have their divorces over as quickly and inexpensively as possible, there are plenty who deliberately prolong divorces to make more money. After all, law is a business and firms expect their attorneys to generate billable hours. For lawyers in private practice, who also have to worry about paying rent and keeping the lights on in their offices, the need to generate more fees is just as important. When you represent yourself, you control the cost of your divorce. Attorneys know they are less likely to get paid if they complete the service for the client before collecting their entire fee. For this reason, when you file for divorce with an attorney, you are usually expected to pay the fees upfront. If you don't have the money to pay your attorney fees, you will have to wait to get your divorce finalized until you do. Even if you are able to pay your attorney fees in full at the outset, you are on your attorney's schedule. One attorney can be juggling hundreds of clients that require varying degrees of attention, and cases that generate more money tend to be prioritized over simple uncontested divorces. In other words, while it may literally take only 20 minutes for your attorney's paralegal to prepare your divorce papers, your file may sit on your attorney's desk for weeks waiting to be reviewed. Attorneys who pad fees not only harm their divorce clients financially, but the frustration both spouses may feel over delaying the divorce because the lawyer insists on unnecessary measures such as a lengthy investigation into the parties' assets and their fitness as parents can turn an otherwise simple and amicable uncontested divorce into a fight that neither spouse wanted or needed. This can be especially damaging if you and your spouse are trying to co-parent. It also merits pointing out that some clients insist that their lawyers make the divorce difficult as payback to their spouse. However, that mindset is inconsistent with do-it-yourself divorce. If you choose to file your own divorce, your goal should be to complete the process as quickly and inexpensively as possible. When both spouses have these goals, the divorce process itself can be relatively quick and painless. Having an uncontested divorce means that your spouse agrees not only to end the marriage, but also that the two of you have reached an agreement on all issues including division of property and debts, spousal support, and the support and custody of any minor children. If any of those issues remain unresolved, you should probably contact an attorney to represent you in your divorce. Dividing Jointly Held Real Estate. If you and your spouse jointly hold real estate, you have a few options. You may want to sell the property and specify in a written agreement how the mortgage, taxes and upkeep will be paid while the sale is pending as well as how any deficit or surplus from the sale will be distributed. In the alternative, you may decide that one spouse will keep the property. Usually, when this happens, the spouse that is giving up the property will need to execute a Quit Claim Deed to have his or her name removed from the title, and the spouse that is retaining the property will need to secure refinancing to have the other spouse's name taken off the mortgage. Generally, your Settlement Agreement will specify the length of time that your spouse has to secure refinancing. Dividing Retirement Accounts. While the DivorceWriter online interview gives you the option to divide a pension or retirement plan, doing so usually means you will need a Qualified Domestic Relations Order, or QDRO, or in the case of non-qualified plans like 401Ks, a Domestic Relations Order. The purpose of a QDRO is to put the employee spouse's plan on notice that when the time comes to begin disbursements, a certain portion must go to the former spouse. You must file a Qualified Domestic Relations Order that satisfies the plan administrator and the court. Inequitable Distribution of Property or Debts. If you and your spouse have a lot of assets and it appears that one spouse is getting significantly more than the other, especially if the spouse receiving less has a significantly lower income, it makes judges uncomfortable. The same is true with a lengthy marriage where there is a great disparity in income between the spouses and the spouse with the lower income is not awarded any spousal support despite it appearing as though he or she will be unable to self-support. The goal in divorce, besides legally ending the marriage of the parties, is usually for a fair distribution of assets and maintaining a living standard for the parties and their minor children that is as close to what it was before the divorce as possible. Significant Deviation in Child Support Amount. The DivorceWriter online interview collects necessary income information for both spouses and then applies that information to the child support guidelines for your state to determine your standard child support amount. You then have the option to use the standard guideline amount or to select a different amount that you and your spouse have agreed on. However, while you can choose a different amount, if that amount varies significantly from the standard calculation, especially if it is much lower, it may cause the judge to question whether the amount is really in the best interests of the minor children. Little or No Parenting Time for One Spouse. While DivorceWriter is designed to accommodate a variety of custody arrangements, courts prefer to see a custody and visitation plan where both parents will have an opportunity to have a meaningful relationship with the children. Often, couples choose joint legal and joint physical custody although it is also common to have joint legal custody with one parent having primary physical custody subject to the other parent's regular visitation with the children. While you may choose for one parent to have sole legal and sole physical custody, if the other parent has little or no visitation with the children, it may be a red flag to your judge.